This has been a busy summer for me. New house, new yard, jobs, etc. etc. For whatever reason, it has been difficult for me to relax and breath and enjoy it all. I have found time to do that, but it has been much less often then I would like. Today was a day that I was determine to do so. 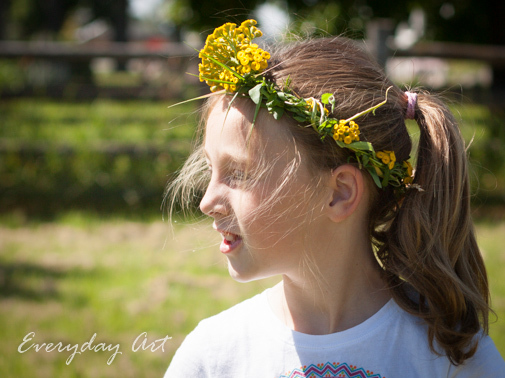 I was determined to relax and make memories and play with my girls. Can one be determined to be relaxed and serene? Seems like an oxymoron, but I suppose that when at times it doesn't come naturally, then we must be determined to let go, to use all that energy and motivation to get things done in a different way. We must channel it and be determined to NOT get things done. We must be determined to pay attention to not the tasks at hand but the relationships at hand. And I knew clearly what I wanted to do with my girls. 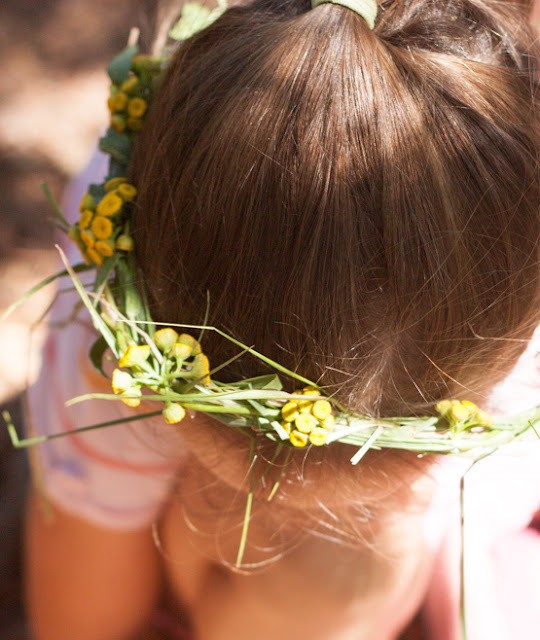 I wanted to make beautiful, natural, summer crowns. 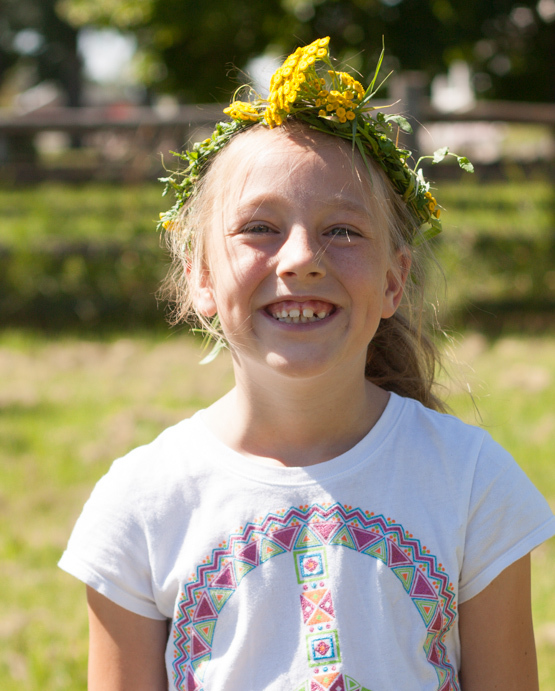 I wanted to make daisy chains and willow weavings. For our summer crowns, we used 2-foot long pieces of grass (being determined of course to not think of the trimming task that hasn't been completed or the buying-and-installing-a-new-spark-plug for the trimmer task that hasn't been completed either). I pulled up that un-trimmed 2-foot long grass and sat down with my girls under the shade of a willow tree, and we braided. We fortified our grass braids with a few un-weeded morning glory weed vines, and they looked strong and lovely. 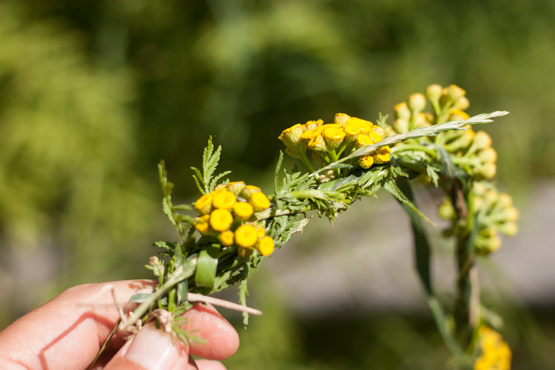 Then we went to the tansy weed and picked tansy blossom clusters to weave into our crowns. And yes, we were interrupted with bathroom breaks and impatience and all the typical things children tend to do, but overall it was a lovely little hour we spent together.